This book was originally published under the title Health and Illness before the decision to publish a series of "From . . . to . . ." books was made — thus the major theme will be on health and illness as seen from many different perspectives. 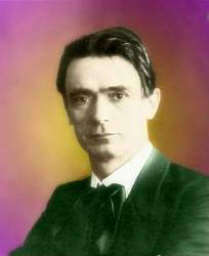 The first example Steiner gives demonstrates the principle "All Meanings Are True" — which means that all one has to talk about is one's self, whether one knows it or not. Here is an example of a man who didn't know he was talking about his own health until it was too late. A prominent financier, William Windom, was addressing a trade and transport convention and began his speech by saying, "We need to reform our whole trade and transport system, for as they are today they contain something unhealthy." He talked about immoral concepts in commerce being like poison in the blood stream. [page 12, 13] Now it struck his listeners that Mr Windom became a bit grey as he spoke of arteries in the context of economic life. They were surprised that someone who had previously spoken only of matters pertaining to economy and finance, who had in fact begun his speech on these subjects, should suddenly use this rather apt analogy and even elaborate on it. He described in detail how poison penetrates the blood and referred to moral concepts. This was indeed a change of subject, and after uttering the words, "Immoral concepts go like poison through the arteries of industrial commerce," he collapsed. He had a stroke and died on the spot. What happened here? He was speaking from an internal script and the internal condition of his body began to provide the metaphors to describe the conditions he perceived in the outside world of commerce. This process of the choice of metaphors is one that I first became sensitive to while studying with Richard Bandler and John Grinder about 30 years ago. If you study carefully the process of selecting which metaphors to use to achieve a certain therapeutic result in others, you cannot help but notice the metaphors you otherwise select at random or spontaneously at other times. You begin to notice that the processes of at random and spontaneously comprise an illusion — an unhealthy illusion at that — and that everything you speak reveals something about you. Attention to what comes otherwise at random or spontaneously out of your mind and mouth is important information that, applied in time, can prevent the type of thing happening to you that happened to William Windom. [page 14] Whenever we talk we are actually always reading something that is going on within us. Naturally, what we say is based upon our external experiences, but that mingles with what goes on in our bodies. Our utterances are actually read off from our inner processes, which of course do not always have such sad consequences for us a stroke. Every time you say something, even if it's only five words, you read it from within your body. As Steiner covers the topic "Illnesses at Different Periods of Life" he explains something that medical science tells us today but doesn't explain why: that various conditions of drug use and illness in pregnant mothers end up creating mentally deficient children. On page 23 there's a drawing Steiner made of a tiny fetus which shows that the most prominent part of the baby at this stage is the head. Any defect in the mother's condition will affect the head of the fetus and create some mental deficiency. [page 23, 24] Whatever the child can inherit must be inherited first of all from its head. Therefore, if the mother is consumptive, one need not be surprised that her condition is not passed on to the lungs of the unborn child, which, after all, are not even functioning yet. The condition is rather carried over into the head and comes to expression in the brain. Thus, nobody should be surprised that the disease inherited is quite different from that of the parent. Venereal disease, for example, can appear in children as an eye disease. It is no wonder, for when the child's head is developing, its eyes are exposed to what afflicts the parents; its eyes are in an environment that's venereally diseased! 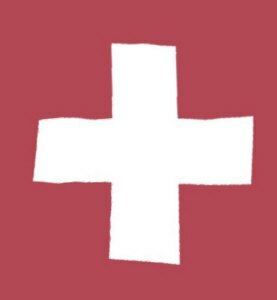 Steiner tells us that the child is more susceptible to diseases between 0 and 7 and 14-21 than between 7 and 14 years-old when it is the most healthy. The 0-7 process is connected with the onset of the new teeth which arise as a result of whole body processes in the child. [page 25, 26] You see, the fact that a child has a second set of teeth shows that its body is sufficiently strong; if it were not, the teeth would not come in properly. Why? Well, you must understand that what is contained in a tooth comes out of the whole body. The second set of teeth emerge from within the whole system; they are the product not just of something in the jaw but of the whole body. This is true only of the second teeth, however, for the first teeth, the so-called milk teeth, are completely different. They are the result of heredity, of the fact that the child's mother and father have teeth. Only after the milk teeth are expelled in the course of the first seven years does the child get its own teeth. The body must make the second teeth for itself. Is genius hereditary? Steiner tells us of Goethe whose father was a "dreadful philistine," whose mother could tell good stories, and whose son was "rather stupid." [page 27] Whatever pertains to the soul and spirit is not hereditary; it is brought into this world from quite other realms and then is united with the part that is inherited. Aside from the time he spends in his mother's womb, man lives before birth as a being of soul and spirit. This was a commonly accepted fact in the early centuries of Christianity when people could still dimly recall their previous lifetime and catch glimpses of the reality of the spiritual world. This ability was fading however and by the end of the first millennium, it became possible for the church to aver that this life on Earth was the only life and we should make the best of this life in order to prepare for an eternity in Heaven. This grand fairy tale was an essential part of the church's plan for the salvation of their flock. And like all fairy tales, eventually the children who have been fed them, grow up. With the advent of the 21st Century, it is time for Christians to grow up and recognize once again themselves as true human beings consisting of body, soul, and spirit — a being on Earth which is a combination of a soul and spirit which has matured over past lives and an body inherited from their chosen parents for this lifetime. This was the reality of Jesus Christ, whose two names represent the earthly and the heavenly aspects of his humanity. [page 27, 28] The only reason people reject this idea today is that all through the Middle Ages the Catholic Church forbade anyone to ascribe to man a life of soul and spirit before birth. It asserted that the soul was created at birth by the kind of God which the Catholic Church assumed to exist. So throughout the Middle Ages, the Catholic Church forbade the concept of pre-existence, as it was called, meaning 'existence before, prior to birth'. Modern materialistic science has merely followed suit and then congratulated itself on its cleverness. Now people think they are extraordinarily clever to hold this opinion; unfortunately, they fail to realize how they were conditioned to do so. In his session on the ear I learned the purpose of the Eustachian tube was to enable us to understand another's speech. If you were to design a computer to recognize a certain song, you would have to somehow play the song in the computer and match the sounds coming from outside the computer to those generated from the computer. The Eustachian tube allows humans to do exactly that. When the sounds of words we hear from others outside the ear match the sounds of words we hear within our ear through our Eustachian tube as we speak the words to ourselves that they are speaking to us, we are able to recognize those sounds and thus understand the words they are speaking. [page 45, 46] When we listen to someone else and wish to comprehend him, the sounds come in through the auricle and make the fluid vibrate. Because the air passes into the ear from the outside, and since we know how to set this air in motion with our own speech, we can understand the other person. In the ear, the element of our own speech that we are accustomed to meets the element of what the other person says; there the two meet. . . . The tube that leads from mouth into the ear [Eustachian tube] was there when I learned to speak as a child. Thus, we learn to understand other people at the same time as we learn to talk. Human beings are a combination of thinking, feeling, and will — and nowhere are these processes in closer contiguity than in the human ear. Here is a synopsis of the layout of these processes in the human ear, given to his audience by Steiner as he points to a diagram of the ear. [page 47] So, indeed, we can say that the memory for tone and sound is located within these three semicircular canals. Here where this arm is located is comprehension, intelligence. Here, within the cochlea is a portion of man's feeling. We feel the sounds in this part of the labyrinth, in the fluid within the little snail shell; there we feel the sounds. When we speak and produce the sounds ourselves, our will passes through the Eustachian tube. The whole configuration of the human soul is contained in the ear. In the Eustachian tube lives the will; here in the cochlea is feeling; intelligence is in the auditory ossicles. Those little bones that look like an arm or leg; memory resides in the semicircular canals. If you've seen the figures usually associated with the four Gospels: man, eagle, lion, and bull, and you've wondered about the significance, Steiner lays it out for you in his Ear Lecture (No.3) of 22 Nov. 1922. [page 50] That gives us the three members of human nature: eagle - head; lion - breast; bull - abdomen. Of course, the ancients knew when they studied the head that it was not an actual eagle, nor the middle realm a lion, nor the lower part a bull. They knew that, and they said that if there were no other influence, we would all go about with something like an eagle for our head above, a lion in our chest region and a bull down below; we would all walk around like that. But something else comes into to play that transforms what is above and moulds it into a human head, and likewise with the other parts. This agent is man himself; man combines these three aspects. Here is an exposition of the nature of the human being that our current medical science would find quaint and outmoded, but it gets at the essence of what constitutes a human being. We are beings who are constantly being poisoned within our body and counteracting the poisons. Health consists not of having a body that is free of poisons, but rather of having one that is able to maintain a homeostasis of poisons and the antidotal hormones which counteract them. [page 59] What is the basis of the efficacy of such substances as those secreted by the hormonal glands? Gentlemen, you can understand this only when you realize that the body is constantly subject to processes of deterioration. It is a peculiarity of the organism that harmful substances are forever being formed in it. The substances secreted by the hormonal glands neutralize the destructive effect of these poisons that form in the body. It is a most interesting phenomenon that the processes of life consist in man's constantly poisoning himself, and then continuously counteracting the effects fo the poisons by means of these little glands placed within his system. The mythical process for falling asleep, much depicted in comics and cartoons, is to count sheep as they jump over a low fence. Steiner offers a method which involves concentrating on one word, and I suppose the two methods are equivalent as the one word "sheep" is concentrated on as each sheep jumps over the fence. He explains that using any sleeping potions, pills or medicine to fall asleep will have deleterious effects on one's health later in life. Notice that an insomniac has to "gain strength" to fall asleep. [page 65] So it is much better to try to cure insomnia by psychological means, combating it in a more inward way. If the patient is encouraged to think and concentrate on one word, he will gradually gain the strength from within to fall asleep. Much interest these days is shown in staying the processes of growing old, but never have I encountered a medical doctor advising the reading of Goethe's Faust as an anodyne for rejuvenation. Steiner tells of one otherwise materialistic doctor who recommended exactly that to his patients. [page 66] There is much truth in this recommendation. If in old age one has an interest that completely occupies one's soul and spirit, something that inspires and enthuses one, this will make one youthful. The meaning of 'inspiration' is that something spiritual enters the mind. Otherwise, the term would not be 'inspiration' but something like 'materialization'. When addressing the public, even materialists do not say, 'Let us be full of materialization!' Though they deny the spirit they nevertheless say, 'Let us be inspired and full of enthusiasm!' Being filled with enthusiasm is indeed a source of rejuvenation in humans. Of course, one cannot prove this in rats! Even as materialists point to the remarkable technologies their way of understanding the world has brought us, we can look all around us and see the concomitant symptoms of premature old age. As early as a hundred years ago, in Steiner's time, this effect was noticeable. [page 67] Nowadays people hardly 30 run around with terribly bald heads, particularly those who belong to the so-called affluent professions. Premature baldness is caused by our unnatural forms of higher education. It would be much wiser to educate people in such a way that the body itself would be capable of holding everything together for as long as it retains its life forces. The next lecture deals with eye and hair color, something that I had always wondered about and had been content with the materialistic answers I had gotten about why this is so. While the concept of the dumb blonde is familiar, as we read Steiner's description of how eye color and hair color comes about, we glimpse the element of truth within this trite cliché. He says that "A person with strong forces drives food substances all the way into his hair, making it brown or black." This does not mean that blond hair peoples are not filled with strong forces, but that much of those forces are involved with surviving in the cold climates where they are most common. [page 80] Consider the Scandinavians. Much of their nourishment must be utilized in fighting off the surrounding cold. A Nordic man does not have enough energy to drive the nourishment all the way into the eyes; his energy is needed to ward off the cold. A man who is born in a warm, tropical climate has in his blood the driving force to push the nourishing substances into his eyes. In the temperate zones it is an individual matter whether a man possesses more or less driving energy. . . . This also affects the color of the hair. [page 81] The earth was once young. Now it is past its prime; it is growing older and some day will perish from old age, though not in the way described by materialists(2). We are already faced with some of the signs of the earth's old age. Therefore, the entire human race has been weakened in regard to the driving force that moves food substances through the body. So what part of the population is going to be the first to disappear from the earth? Dark people can last longer, for they possess greater driving force; blonds have less and become extinct sooner. The earth is indeed already into its old age. The gentleman who asked the question pointed out that there are fewer blonds around than in his youth. Because the earth has less vitality, only the black and brown peoples attain sufficient driving force; blonds and blue-eyed people are already marked for extinction because they can no longer drive nourishment with the necessary force through their bodies. Two other minor puzzles were cleared up for me in these next two passages. The first is how does our Schnauzer know that it's me coming into the bed late at night in deep darkness and not a stranger. The second is why women blow their noses when they cry. Both of these I've always accepted as natural, but Steiner clearly explains them both at the beginning of Lecture 6 on "The Nose, Smell, and Taste." It never occurred to me that a dog's primary sense for recognizing people is smell. [page 83] A dog recognizes people by smell long after it has last been with them. Anyone who observes dogs know that they recognize and identify somebody with whom they have been acquainted, not by the sense of sight, but by that of smell. [page 86] You will have noticed that children who cry secrete a lot of nasal mucus. A canal in the upper part of the nose leads to the tear glands, which are located on both sides in the interior. There the secretion the tears enters the nose and mixes with the nasal mucus. Thus the nose has a kind of 'fluidic connection' with the eyes. The secretion the eyes flows into the mucous membrane and combines with the secretion of the nose. Your dog wags its tail when it sees you because it is happy to see you and its joy runs down its spine to the very end which is the tip of its tail. In humans the absence of a tail causes the same feeling of joy to reflected back into the brain, which if unimpeded by the skull would indeed wag. Fawning courtiers or eager subordinates in modern business can give one the impression that they are wagging like a dog when royalty or VIPs wander by. What wags is a bit of warmth in the front of their heads. [page 93] Now it is warm, now a little cooler, warmer, cooler. Someone with a delicate sensitivity for this fluctuating warmth, who is standing in the presence of courtiers surrounding Lords, sees something that looks like a fool's cap (RJM Note: like a jester wears) wagging back and forth in the front. It is correct to say that the etheric body, the more delicate organization of man, is wagging in front. It is absolutely true that the etheric body wags. I remember in the decade of the 1970s when health food stores and restaurants were all the rage that a place I went to buy books and occasionally had a smoothie and an avocado sandwich refused to stock black pepper to season its sandwiches. When asked why, they mumbled something about the pepper being trash that just went right through the intestines and never was digested. Their logic was impeccable, but I knew deep down inside, somewhere around my digestive tract, that something was very wrong about this logic. Then I read in this chapter that what smells do to the tail of dog, tastes do to the digestive system of a human being. Imagine your dog waving its tail enthusiastically in joy over seeing you approach. Now imagine your stomach becoming just so receptive to greeting a food that you have just placed in your mouth and tasted! Your stomach has thus geared itself up to receive and digest gladly and in joy the food it has tasted, and the better the food tastes, the better the preparation for digestion the food will receive when it reaches the stomach. By removing black pepper what these otherwise well-meaning restaurants did was dampen the digestive systems of their patrons and reduce the joy of life which they might else experience through a digestive system that worked as efficiently as possible, in fact, working in joy! Gladly that decade with its concomitant mistakes is behind us. Once more, a fuller understanding of Steiner's writings could have prevented this mistake. Another problem that is yet with us today is the restricting of salt to avoid high blood pressure. Salt is another spice that enlivens the digestive system as soon as it hits the tongue, preparing the digestive system by creating elation and joy in it. Over the past hundred years, salt has gone from being bad for blood pressure to being good for it and back and forth. Currently it is still considered bad. This shows that doctors really don't know for sure whether it's bad, but nevertheless they follow the current fad in their recommendations to their patients. Not once have I heard a doctor's recommendation that small amounts of salt used for making food taste better will improve one's digestive system and thereby lead to longevity by improving the quality of a person's life. I have tasted many bland meals prepared by my mother, which would otherwise have been delicious, had my mother's doctor not fed her such foolishness. I could add salt to enliven the taste and my digestive system, but she could not. She lived to 82, and died from the consequences of arthritis and a fall, not from hypertension. She never had high blood pressure even though she was over weight. I wonder if the excess quantity of food she ate was compensation for the lack of taste she felt obliged to endure. Some thirty or forty years of her life were made tasteless and unhealthy due to some fad of the materialistic medical profession that deems a number on a chart to be more important than the quality of life, up until now. [page 98] The tip of the nose is the farthest in front, and the tail is the farthest behind. What is connected with smelling in the dog passes through the entire length of its body, but what it tastes does not; it remains in the abdominal area and does not go as far. . . . You will gain much from realizing that the dog owes its whole tail-wagging ability to its nose, and that when it feels good in the abdominal area this is due to the nerves of the mouth. In our garden, I used to pluck the flower stalks from the onions as soon as they appeared. Then I discovered one year that the onions made a beautiful spherical blossom of tiny white flowers if I left the flower stalk develop. Now each year we delight as these knee-high puffs of flowers decorate our garden. Our skin is like a garden with the soil on the inside planted with thousands of tiny onions which blossom at the tips of their flower stalks in our brain. These tiny onions are called 'Pacinian corpuscles' after the Italian who discovered them. These bulbs implement our senses of taste, smell, and touch in our bodies, carrying the signals into the far reaches of our brain from our tongue, nose, finger tips, and other sensory areas of our body. It is the sense of taste that causes fishes to swim long distances during their life cycle. They follow the traces of salt in the water to the ocean. Birds do a similar thing with migrations. I have heard all sorts of theories about how migrating birds follow the Earth's magnetic fields for their migrations, but this explanation seems a bit odd as the magnetic field does not change with the seasons of the year. Steiner's explanation to us is much simpler and explains how the birds not only know where to go but also when to go: odors. Like fishes follow tastes for their migrations, birds follow odors. [page 107] The swallow has an extraordinarily delicate sense of smell. You remember that I told you that people of savage tribes could smell someone as far away as Arlesheim. Well, for swallows the odour arising in the south is perceptible when autumn is approaching; it actually spreads out all the way to the north. While in the south it smells good, up north it begins to smell of decay. The swallows are attracted to the good odour and fly south. Our brain thinks because it cannot fly. We owe a lot to our nose. [page 111] We human beings have only our clumsy shoulder-blades attached to our back, which are clumsy and solidly shaped. Although we would constantly like to fly with them, we cannot. Instead, we push the whole spinal marrow into the brain and begin to think. Birds do not think. We have only to observe them properly to realize that everything goes into their flight. It looks clever, but it is really the result of what is in the air. Birds do not think, but we do because we cannot fly. Our thoughts are actually the transformed forces of flying. It is interesting that in human beings the sense of taste change into forces of feeling. When I say, 'I feel well,' I would really like to swim. Since I cannot, this impulse changes into an inner feeling of well-being. When I say, 'the odour of the manure repulses me,' I would really like to fly away. But I cannot, and so I have the thought, 'This is disgusting; this odour is repulsive!' All our thoughts are transformed smells. Man is such an accomplished thinker because he experiences in the brain, with that part I described earlier, everything that the dog experiences in the nose. One cannot expect to comprehend the concept of a sense of warmth easily, but if you think back to when you were suddenly frightened, "Did you not shiver or feel a sudden chill?" And yet the area around your body did not become colder — it was an inner phenomenon you felt. Our expression, "to freeze in fright" refers both to the coming to a stop and to the drop in inner temperature that a person in fear instantly experiences. Do you suppose that one's body could instantly drop its temperature? No, of course not. Is this sense of warmth only an activity sensed by the little nerve bulb onions spread around our body on the skin? If so, how could they react to an instantaneous change in internal temperature when one gets frightened? Science, which does not acknowledge the presence of the Ego or "I" throws logical explanations at this phenomenon, but being logical does not make them true. [page 114] There are no nerve bulbs sensitive to warmth, because the whole human being is perceptive to warmth. These nerve bulbs are used only for sensing solid, water and vaporous substances. Where the sense of warmth begins, we become no more than a bit of warmth that perceives exterior heat. When we are surrounded by an amount of heat that enables us properly to say 'I' to ourselves, we feel well, but when we are surrounded by freezing cold that takes away from us the amount of warmth that we are, we are in danger of losing our ego. The fear in our ego makes the cold outside perceptible to us. When somebody is freezing he is actually always afraid for his ego, and with good reason, because he pushes his ego out of himself faster than he actually should. Understanding the nature of warmth and its connection to Ego, allows us to understand such paradoxes as expressed in this story I read forty years ago which I made a strong point to remember, but without knowing why, up until now. A woman tourist saw a native American Indian with no shirt on standing out front of a store in the winter time. She said to the Indian, "Why do you wear nothing on your chest? Aren't you cold?" The Indian looked at her and said, "Paleface wear nothing on her face." The Indian was not afraid of the cold on his chest and the woman was not afraid of the cold on her face, so neither felt anything but warmth there. Materialistic science dissects dead human bodies and offers us an understanding of the human corpse. Steiner gives us an understanding the full, living human with all four bodies: physical, etheric, astral, and Ego. Louis Pasteur and Claude Bernard were two famous French physicians and scientists. Pasteur discovered that large amounts of bacteria were present whenever a disease flamed up and said that the bacteria caused the disease. Bernard agreed that bacteria are found where diseases exist, but the bacteria are a side-affect, not the cause of the disease. These two fought this battle for who was right in public and private, and the rest is history. Pasteur has apparently won, because medical science is still attacking diseases with medicines that are designed to kill bacteria and other microbes. What is not well-known is that Louis Pasteur said to a friend on his deathbed, "Claude Bernard was right." In this next passage, as he talks about bacteria and bacilli, it is clear that Steiner would agree with Bernard and also with Pasteur's death bed confession. [page 117] The infectious diseases are based on their capacity for tremendous multiplication. These minute beings do not actually cause the illness, but a feeling of well-being is engendered in them when something is ailing us. Like the plant in manure, these little beings feel well in the stricken organs of our body and like to remain there. Anyone who claims that they [RJM: these microbes] themselves cause disease is just as clever as one who states that rain comes from croaking frogs. Frogs croak when a rain shower comes because they feel it and stay in water that is stimulated by what is active in the rain, but certainly do not cause the rain. Likewise, bacilli do not bring about a disease like flu; they only appear whenever the flu appears, just as frogs mysteriously emerge whenever it rains. What is the one thing people universally do when they get ill? They lie down in bed. Why? As with any question that "everyone knows" the answer to, the full answer is hidden. We lie in bed because we thereby expel from our body the earthly forces that are making us ill. We are not just meat and bones that have weight when we stand on a scale; a corpse has weight, but does not live. Our meat and bones are the only earthly parts of our human body and we shield ourselves from these parts to stay well. [page 130] Anyone is a fool who thinks that as human beings on the earth we consist only of what is heavy, of the body that is put on the scales and weighted. This part we do not need at all. It is nonsense to think that we consist of these material substances that can be weighed. In reality, we do not become aware of the body at all, because we shield ourselves from it in order to stay well. The curing of illness consists in expelling the earthly influences that are affecting the sick person. All healing is actually based on removing the human being from the earth's influence If we cannot remove man from the earth and its influences, we cannot cure him. He then lies down in bed, allows himself to be supported by the bed and gives himself up to weight. When one lies down one does not carry one's own self. Just as materialistic science and medicine would like to do away with or ignore the etheric, astral, and Ego bodies and retain only the physical earthen body, so also do they try to do away with or ignore the living Christ and retain only the cross of Christ. This has certainly happened in Christian churches, which before the 9th Century, prominently displayed images of the living Christ symbolized as the Good Shepherd, and since then they instead mostly display a human man dying on a crucifix or cross. Speaking a couple of days before Christmas, Steiner tells us of the importance of the festival of Christmas. [page 131] Christmas should remind us that once again a science of the spirit must be born. The science of the spirit is the best spiritual being that can be born. Mankind is much in need of a Christmas festival. Otherwise, it does away with the living Christ and retains only the cross of Christ. Ordinary science is only the cross, but we must arrive at what is living once more. We must strive for that. But why is it, you may be thinking, that we seem to get sick shortly after visiting someone with a given sickness? Surely the fact that we get the same kind of flu they had indicates that the microbes from their body must have entered our body? Yes, we do get sick and yes, the same microbes can be found in our body, but one should be careful of the followed-by, thereby caused-by fallacy that is a favorite ploy of materialistic science and medicine. What happens inside of us when we listen to someone talk who is hoarse or under the pressure of feeling ill from any disease? We begin to feel internally the same way as they do and thus we become a willing host for any microbes which might be floating around. [page 138] Listening to someone who is hoarse is a particularly uncomfortable and constricting experience. Why do we experience such sensations while listening to another? It is based on the fact that in reality we always inaudibly repeat whatever the other is saying. Listening consists not only in hearing but also in speaking faintly. We not only hear what another says but also imitate it with our speech organs. We always imitate everything that someone else does. Have you ever noticed that someone with the flu has a very slight smell around them of garlic or onion? I hadn't but Steiner points out that garlic and onions thrive in a soil that contains sulphur and phosphorus and when someone has the flu these same substances are present and causes one to smell of garlic and onions. [page 139] This odour is always like that of onions or garlic and can be detected by someone with a sensitive nose. Just as we tune in on and imitate a shrill and rasping voice, so do we join in with what an ill person evaporates. As a consequence, our own astral body, our own activity, becomes disorganized. This disorder causes a chemical basis that in turn makes us contract the flu. It is like making soil suitable for onions and garlic. At first, then, the illness has nothing to do with bacteria but simply with the relation of one person to another. . . . Bacilli are not even necessary for one person to catch the flu from another. Instead, by imitating with my fluid organization what is happening in the patient's fluid organism, I myself produce a favourable environment for the bacilli; I myself acquire them. The sick person need not bombard me with them at all. In Lecture 12 "The Effects of Alcohol" Steiner explains how alcohol causes a hangover due to uric acid and other waste products being deposited everywhere, especially in the head, which causes the typical morning after hangover. He even describes what is usually called the "hair of the dog" hangover cure in which one takes a strong alcoholic drink in the morning to ameliorate the effects of the hangover. While this trick works to remove some of the headache by displacing it to the rest of the body, its long term effects on the rest of the body are most detrimental. [page 182] Additional drinking in the morning thus unconsciously transfers the hangover to the rest of the organism. Only now, when this occurs, does the real misery for the body begin. Those alcoholics who drive away a hangover with more drinking are in the worst shape, because gradually, as this is repeated, the entire body is ruined. One of the signs of ruination in an alcoholic is the condition know as the DT's or delirium tremens in which people see themselves being attacked by small animals from all sides. In the Rhine River Valley of Germany there are several structures known as Mouse Towers. Steiner tells us they got their name because people imprisoned there who suffered from the DT's would go crazy from the mice they hallucinated everywhere. (Page 182) In cocaine the hallucinations take the form of snakes coming out of one's body from all over. The effects of nicotine are to stimulate the heart, increasing the pulse rate and stimulating the circulation. This next passage will shock most people who have been conditioned by materialistic science and medicine to think of the heart as a motor-operated pump like the water pump or fuel pump of their automobile. Yes, the water pump moves water through the inanimate entrails of a mechanical automobile, but the human heart is neither inanimate, nor mechanical, nor a pump. If you have a chance to watch a video, as I did, of a tiny fetus without a fully formed heart showing a pronounced circulation of blood, you might be at a loss to explain how an almost non-existent heart could be powering its circulation. (3) If, on the other hand, you must use a mechanical analogy to understand how the human heart works, try this one that Steiner offers in another place where he deals with this subject more definitively: the heart is like a hydraulic ram which the circulation of the blood pushes against and it is this opening and closing of the valves of the heart that simply modulate the circulation into pulses. Why are the pulses even necessary? Because the turbulence inside of the heart produced during the pulses is essential for the mixing necessary for an efficient oxygen-carbon dioxide exchange that must go on in the heart-lung cycle. The other obvious side benefit is the outside signal of the rate of circulation which doctors have used since time immemorial as a figure of merit of one's current condition of health. [page 218] Through nicotine, an increased, stronger activity of the heart is called forth. The heart is not a pump, however, but only reflects what goes on in the body: the heart beats faster when the blood circulates faster. If nicotine helps increase the blood circulation, why isn't this a benefit? In the short term, it is, and this is one of the reasons that people smoke products with nicotine. But if one were to increase the speed of the fuel pump in one's automobile without increasing the amount of air being provided to mix the fuel with, one would soon have carbonized the insides of the cylinders and fouled the spark plugs. In a sense, this is what happens when one smokes — the heart rate speeds up but the respiratory rate, how fast one breaths, stays the same. "The result is that the blood doesn't receive enough oxygen, since a certain amount is supposed to be absorbed into the blood with each pulse beat." (Page 220) A shortness of breath occurs because of this. [page 220] Every shortness of breath causes with each breath a feeling of anxiety. It is easier to control a normal sensation of anxiety than this terrible slight anxiety, of which one is completely unconscious. When something like anxiety, fear, or shock remains unnoticed, it is a direct source of illness. I hope you can get a flavor for the remarkable insights possible for a spiritual science infused practice of medicine. The interpretation of symptoms by a doctor practicing this kind of enlightened medicine is dramatically different from the interpretation of the same symptoms by the usual allopathic doctor. [page 221] Nicotine poisoning, therefore, can be recognized by the fact that such people's thoughts are no longer quite in order. They usually jump to conclusions much too quickly. They sometimes intensify this overly rapid judgement to paranoid thoughts. We can therefore say that the use of nicotine for pleasure actually undermines human health. Steiner, however, recognizing the benefit for someone with a low pulse rate, who suffers from weak blood circulation, went so far as to say that a doctor may even advise such a patient to smoke. Today they would try to solve the problem by giving the patient some drug to speed up the heart rate. But would a doctor today prescribe that someone take up some difficult reading material to increase their circulation? No way. And yet Steiner shows us the connections that would make such advice beneficial. First, it should come as no surprise if one says most people earn money doing things they don't like to do, and when they're away from the boring office scene, they amuse themselves with distracting entertainment. It was so even in Steiner's time at the beginning of the 20th Century. [page 223] They go to their offices and busy themselves with something they actually dislike but that brings in money. They sit through their office hours, are even quite industrious, but they have no real interests except going to the theatre or reading newspapers. Gradually, things have been reduced to this. Even reading books, for example, has become a rarity today. Think how much more of a rarity is reading books today, especially difficult books. Think of how the new technology has supplemented the kinds of entertainment that the theater and newspapers provided in Steiner's time: television, stereo's, sports, etc. And yet, in the midst of all this largess, there is an emptiness, a restlessness, that fills the small gaps between the distractions. [page 223]That this has all come about is due to the fact that people don't know at all what they want. They must be told what they want. Reading newspapers or going to the theatre stimulates the senses and the intellect but not the blood. When one must sit down and read some difficult book, the blood is stimulated. As soon as an effort is made to understand something, the blood is stimulated, but people do not want that any more. They quite dislike having to exert themselves to understand something. That is something quite repugnant to people. They do not want to understand anything! Doesn't this sound like it could have come from a lecture given last night instead of last century, a day ago rather than a hundred years ago? So what? — you may be thinking — What does that have to do with me? Let's take a look into your future using Steiner's time machine and you decide for yourself. [page 223] This unwillingness to understand causes their blood to thicken. Such thick blood circulates more slowly. As a result, a remedy is constantly required to bring this increasingly thick blood into motion. It is brought into motion when they stick a cigarette into the mouth. The blood doesn't become thinner, but the blood circulation becomes ever more difficult. This can cause people to become afflicted with various signs of old age at a time in life when this needn't yet occur. Okay, you say you don't smoke. But people do take medications whose primary purpose is for some other problem, but, perhaps unknown both to them and their doctor, the corrective effect stems from increasing the blood circulation. And such corrective effect has all the deleterious side-affects of pre-mature aging that cigarette smoking has. Another debate that rages in various circles with more smoke and mirrors than substance is over what is the healthiest type of food for a human being to eat. Should one eat meat or not? If so, what kind of meat? Steiner takes us on a guided tour through the various types of animals that eat only plants, plants and animals, and only animals. By careful observation he is able to point out that the animals that eat only plants have a long intestine whose job is to digest plant foods and create its own flesh from them. A human being can do both and therefore it is a matter of individual decision what kind of food to eat. If one comes from a long line of meat eaters, one may have a shorter intestine than other humans who thrive on eating only plants, and thus one might find a benefit from eating some meat in one's diet. Oxen or cattle, however, cannot achieve any benefit from eating meat, even a small amount in their diet. 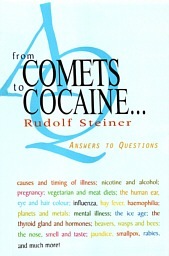 Cattle fed with any meat-based products, even as a dietary supplement, are in danger of suffering from exactly the disease that Steiner pointed to 80 years ago, and the whole current wave of "Mad-Cow Disease" or BSE (Bovine Spongiform Encephalopathy) could have been avoided if people had heeded his words. Even now scientists are still trying to figure out if the BSE epidemic in Great Britain may have stemmed from allowing pig's guts to get into cattle feed. Read on, and you decide. First, he tells us that "if an ox were suddenly to turn into a meat eater, it would fill itself with all kinds of harmful substances such as uric acid and urates." [page 227, 228] Now urates have their specific effects. The specific effects of urates are expressed in a particular affinity for the nervous system and the brain. The result is that if an ox were to consume meat directly, large amounts of urates would be secreted; they would enter the brain, and the ox would go crazy. If an experiment could be made in which a herd of oxen were fed with pigeons, it would produce a completely mad herd of oxen. That is what would happen. In spite of the gentleness of the pigeons, the oxen would go mad. Other than completely eliminating the possibility of eating hamburger from cattle that have been fed animal products, is there any advantage of becoming a vegetarian today? Steiner gives us a few advantages, but not any that will appeal to the majority of people, up until now. [page 229] It is certainly possible to be a vegetarian today, and it has many points in its favour. One of the main advantages of eating only vegetables is that one does not tire as quickly. Since no uric acid and urates are secreted, one does not tire as quickly but will retain a clearer head and think more easily — if one is in the habit of thinking! A person who cannot think does not gain anything by freeing his brain from urates, because it is necessary for the whole human organization to harmonize. In any case, through self-control, a person can become a vegetarian today. Then he uses those forces that, in people who eat meat, are simply left unused. In many movies I have noticed that strange or alien beings newly come to Earth are portrayed as consuming large quantities of sugar; Men in Black, Michael, The Coneheads, and Starman, just to mention a few that come to mind. Nowhere else have I ever seen an explanation offered for this ubiquitous phenomenon, up until Steiner. In several other places, I'd encountered in Steiner's writings how sugar acts to bolster the Ego or "I" or Individuality of a human. Any alien being arriving on Earth would do well to bolster their Ego quickly upon arriving on Earth. Eating too much sugar leads to the deleterious effects of diabetes, in which the body is not able to process all the sugar and discharges it in the urine. I don't know if the differential consumption of sugar for England and Russia still holds after 80 years or more, but one can certainly find an increase of sugar usage in newly developed countries all over the world. [page 229] This can even be verified by statistics. Much less sugar is consumed in Russia than in England. This really accounts for the entire difference between the Russian people and the English. The English are self-aware and egotistical; the Russians are unselfish and physically not as vigorous. This is related to the lower sugar consumption in Russia than in England, where a large amount of sugar is eaten in the food. Steiner also points out the prevalence of diabetes in modern society and tells us one thing that we can all do to avoid it, which is to avoid eating pork. Unless one can trace one's ancestry back to for thousands of years and ensure that one has absolutely no Jewish blood, it would be better to avoid pork and pork products. Eating pork makes it more difficult for our body to process sugar. Since discovering this relationship between pork and diabetes, I have asked out of curiosity when someone has told me that they have diabetes, "Do you eat pork?" and invariably the answer has been, "Yes, I love pork." One man told me he had a freezer full of pork. The Jewish race have a particular difficulty processing sugar and their Kosher dietary laws are designed to prevent diabetes. [page 230] In recent times, Jews have gradually neglected their dietary laws, although they still remain within their racial relationships. Since the dietary rules are really rules for a specific racial group, to abandon them is detrimental, and they therefore succumb more readily to diabetes than other people. That is how it is. Steiner explains how the appearance of an illness resembling typhoid was really the masked ailment of the brain resulting from an operation to eliminate crossed-eyes. I expect the reaction he received from doctors of his time would be almost as strong as those of today's doctors. "Pure nonsense!" a modern doctor would say. I'll give you a true story from recent events. A friend's of mine 84-year-old father was taken to his family doctor who happened to be the chief of staff of a prestigious hospital. He had collapsed and apparently had a small stroke and was unable to stand up without assistance for a full day. Afterwards, his mobility came back slowly, but he experienced hemiplegia — a slight paralysis of his right hand which gradually disappeared as he worked with it. All these things were obvious to my friend and the members of her family. Her father's doctor ran extensive tests, including an MRI of his brain to locate any indication of a stroke. The MRI showed none, so the doctor told the man that he had severely infected sinuses and that was what caused his vertigo and inability to stand up. He treated him with medication for the infected sinus. I'm certain that when my friend's family reported that their father was doing better, the doctor said something like, "See, the sinus medicine worked." This was said with the complete confidence of a chief of staff of a major hospital. The only problem is there is no case in the medical history books of a sinus infection causing hemiplegia! Since the doctor could see no strokes on the MRI, he concluded that there must have none! This next portion deals with comets and will be difficult unless you're already a chemist. During earlier portions of the Earth's existence, during a phase Steiner calls Old Moon, the planetary body we live on existed with similar conditions to what we call comets in the heavens today. Its atmosphere consisted of a nitrogenous "atmosphere" (mostly liquid) where nitrogen took the place of oxygen. In such an atmosphere, our oxygen-based compounds were replaced by nitrogen-based compounds. Thus, cyanogen, C2N2, was as common in that atmosphere as carbon dioxide or CO2 is in ours; hydrocyanic acid was as common as carbonic acid. Our human ancestors of that time used the hydrocyanic acid to produce uric acid which it used in constructing the human head. Where can we find examples of humans living in such conditions today? Every human baby in the womb lives in just such conditions — they begin as all head, take in cyanic acid, and produce uric acid in the continuous construction of the completed head that will present itself at birth. A baby in the womb lives under the influence of the Moon and constructs its individual head in the same kind of "atmosphere" that humankind lived in during the time it was constructing the model for the human head. [page 262] Man didn't need oxygen to stay alive in earlier ages but instead required nitrogen, and was formed by means of it. Man was fashioned during a comet-like stage of the earth, and the relationship between breathing and the blood was completely different in those earlier stages. [page 266] So one can say that the part of the human organism in which the child develops, the womb, is really like a miniature earth that has remained behind and is still in an ancient comet-like state. During the Old Moon or comet-phase of our planet, humans absorbed nitrogen just as the comet-earth did: from the universe. "Breathing at that stage was also a form of fertilization." [page 267] This is only retained today in the process of fertilization in humans and animals. In fertilization, therefore, something of the nitrogen breathing process still takes place, because the most important element in the human sperm is nitrogen. This is transmitted to the female organism and, as a nitrogen stimulus, brings about what oxygen could never accomplish, that is, formation of the organs that must be present later when man is exposed to oxygen. So you see that we actually receive our breathing from the universe. Now for some arithmetic of life. Shouldn't be too difficult, if you made it through the organic chemistry above. We breathe on the average 18 breaths a minute. That multiplies out to 25,920 breaths per day. The average human lives to 72 and multiplying that by 360 days in a year, you also get 25,920 days. "We take in as many breaths per day as we have days in our human life." Coincidence, or deep truth? [page 267, 268] But a day, too, is in a certain sense a breathing. One day is also a breath. When I go to sleep, I exhale my soul, and I draw it back in again when I awake: exhalation, inhalation. I exhale the spiritual and inhale it again. This rhythm in my breathing I therefore have throughout my life on earth in sleeping and waking. This is most interesting: 25,920 breaths per day; 25,920 days in the average human life. Let's proceed to look at what constitutes a year in the Earth's life. The Earth is like a top spinning on the ground. We've all seen a top spinning: at first it is completely vertical and then the top's axis begins to spin around the vertical in an activity called precession. The Earth precesses on its axis as well, which effect could be plotted by the ancients by carefully charted the constellation in which the Sun rose at the time of the vernal equinox (the Spring day of equal daylight and dark). This made a complete circle through the constellation in exactly 25, 290 years. [page 268] It is the same ratio. Even the cosmic rhythm harmonizes with the faster rhythms of breathing and blood circulation. Just imagine how man stands within the cosmos! He is really a child of the universe. The cosmos is his original father and mother. The days of the week were named after the planets as originally named by the ancients, which included the Sun and Moon under the rubric of planet. We can easily recognize SATUR-day, SUN-day, and MON-day, and with the help of foreign languages can recognize Tuesday is MARS-day (in French, MAR-di), Wednesday as MERCURY-day (in German, WOTAN-day; French, MERCRE-di), Thursday as THORS-day or JUPITER-day (in French, JEU-di), and Friday as VENUS-day (in French, VENDRE-di). In the course of every week we progress through the planets which are our heritage. We also progress through the entire evolution of the Earth, rightly understood, which proceeds from Old Saturn, Old Sun, Old Moon, Earth [includes Mars, Mercury], Jupiter and Venus. Coincidence, or deep truth? [page 278] Hence, the days of the week are named after the planets. Why is that? Because these names originated at a time when people still knew that man is dependent on the universe. Through the very fact of being alive, all the planets have an influence on us. The days of the week were named accordingly . Today this is called superstition, but calling it superstition is nothing but ignorance. Actually, tremendous wisdom is contained in the naming the days of the week. Yes, gentlemen, in all these matters there lies a tremendous wisdom. Another realm in which coincidence or deep truth lies to be discovered is in the association of certain metals with the planets. One can find these listed in any book of astrology and their very presence there is enough to relegate this knowledge to the realm of superstition. How did these associations get started? Was it due to some vision of a mystic long ago? Well, it turns out to have been much simpler. These associations came about because the ancients observed that some people sick with a typhoid-like illness recovered and others didn't. Over time they began to notice that those who survived, had the illness at a time when the rays from Venus could not fall upon the sick ones. They experimented with various metals and found that copper helped the patients in the same way that blocking the light of Venus did — those treated with copper recovered. They made the connection that something in the Earth, namely copper, acted to block the rays of Venus from penetrating the Earth and reaching the person. By extension of this process they found the other elements in the Earth that blocked the influences of the other planets as well. Below is compilation of the planets, elements, and sicknesses — the elements are those useful for healing the associated disease. If one studies plants, one will find plants which contain minute quantities of these various elements in their leaves which can then be used for medicinal effect. The Benedictine monks were masters at the art of using these elements for a curative effect, but their work was eventually suppressed by the Church as being un-scientific. One can scarcely locate information about the elements contained in leaves in any scientific book extant, up until now. [page 300] This is how healing is related to what can be known about plants. You can see that today things are no longer in order when even the thickest book on botany, although containing all kinds of information, nevertheless lacks the most important instruction medical men should have. There is no mention in these books of the metals that are dissolved in blossoms or roots. If at all, they are noted only in passing. This is a most important point, however, because it shows us that a plant that still contains copper today, for example, is related in its growth process to the planet Venus; it actually opposes the force of Venus and develops it own Venus force by absorbing copper into itself. This knowledge of which plants to use can be understood if one simply pictures the human being in its inverted relationship to the plant world. If you do this, you will be able remember which portions of a plant are most likely to be helpful for certain illnesses. [page 301] One must realize the following, for example. One must start with illnesses that affect the human abdomen. If one has such an abdominal illness, one comes to know that the substances present in the blossoms or the highest leaves of plants are especially helpful. Good remedies can be produced for illnesses of the abdominal organs by extracting certain substances from the blossoms and leaves of plants. Substances taken from the roots of plants, however, provide especially beneficial remedies for everything connected with the human head. If one imagines a tree whose root system is where the human brain is, and its leaves spread out down throughout the human body, one would have a really good metaphor for the human nervous system. Coincidence or deep truth? One always confronts this dilemma in reading Steiner's works. How can one decide? A person may occasionally stumble upon a coincidence and claim it to be a deep truth. One can easily ignore such scattered occurrences and pass them by as if a coincidence rather than a deep truth. Even a non-magician can occasionally reach into a hat and pull out a rabbit. But someone who time after time, lecture after lecture, book after book, reaches into the cosmic hat and pulls out a rabbit of wisdom, ahh, there's a magician to be reckoned with! 1.) In 1964 through 1966 I worked for Professor Hal C. Becker as his research associate on an image processing project at Tulane Biomedical Computing Systems. 2.) RJM Note: Just today, May 22, 2003, in the local newspaper, the Times-Picayune, George Will wrote, "As the Earth heads for frigid lifelessness. . ." It is 80 plus years after Steiner spoke and still the consensus about the end of our Earth in frigid lifelessness remains, notwithstanding the pronouncements of spiritual science that our beloved planet will one day vaporize in a fiery blast on that day when "stars shall rise and set no more."